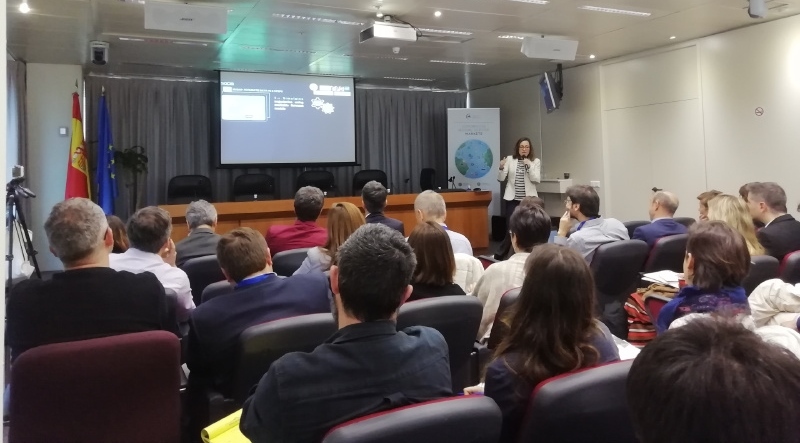 SOCIB have participated in the event Copernicus Marine for Spain, organized by Puertos del Estado, el Ministerio para la Transicion Ecologica (MITECO), the Centro para el Desarrollo Technologico Industrial (CDTI) and Mercator Ocean International (MOI) on the 28th of March 2019 in Madrid. The Copernicus Marine Environment Monitoring Service -CMEMS- is "an operational European service by European experts to offer the best worldwide information on Marine Environment based on observations and models", by quoting Pierre Bahurel (MOI Director). The potential of the Satellites (S1, S3, Jason-3, S6, S2), Services (Marine, Atmosphere, Land...) and InSitu components was presented. As the main novelty, the WEkEO platform was introduced as an emerging component of Copernicus designed to foster and bring innovation in data access. WEkEO is one of the five DIAS (Data and Information Access Service) platforms implemented by Copernicus. As Andrea Pérez-Carro Ríos (CDTI) mentioned, Spain has risen as the 5th contributing country to the Copernicus Program, as it was revealed by the high participation of Spanish institutions (see in the attached Agenda), demonstrating great capabilities in the three components: space, services and in-situ data generation. providing also its testimony as intermediate-user of CMEMS-MED MFC, with the presentation from Baptiste Mourre about the Western Mediterranean Operational Forecasting System (WMOP), a regional downscaling of the former. On the other hand, the researcher from IMEDEA (UIB-CSIC), Ananda Pascual, gave a presentation about "The CMEMS Sea Level Component and MedSUB Service Evolution Project". This latter aimed to understand meso and sub-mesoscale ocean interactions to improve Mediterranean CMEMS products, from which SOCIB was partner. to discuss needs, priorities and future expectations in terms of CMEMS data. to analyze the weaknesses (lack a clear long-term users engagement, motivation and attraction to private sector, data and services potential locking) and strengths (robust and reliable services and products, increasing number of variables to address more sectors' needs, high spatio-temporal resolution provided) of CMEMS. to present the CMEMS future roadmaps in terms of data and services. to introduce the emerging components for Data and Information Access. to promote the creation of customized services. to establish synergies between institutions, intermediate and end-users.